Last year I applied for a grant from the Senatskanzlei Berlin for the 2015 digiS funding programme. digiS is a state-wide (i.e. Berlin-wide) programme intended to coordinate and support digitizing efforts.They have an about page on their website that is in English, all the rest is in German (sorry!). I had heard that there were a lot of applications in 2014, and that it would be difficult to get an application funded. However, the rules for applications were fairly straightforward, and they didn’t ask for a lot – just a clear description of the intended project with some background, a short discussion of why it is important, and who will benefit from the results. Along with that a short financial plan – a really simple one. And that was all that they asked for! In sum, I decided that the programme was worth a shot, as the cost of writing an application was not out of proportional to the potential gain. The digiS programme limits individual projects to 100,000 € and a maximum run-time of one year (i.e., starting at the earliest on January 1, 2015 and ending at the latest on December 31, 2015 in this case), but I was unofficially informed that successful projects in the past had never received more than 50,000 €. Given the overall limits, digiS obviously wants to fund not just one or two projects a year, but a wide diversity. After all, digitization has many forms, and the cultural heritage institutions in Berlin have diverse needs. Therefore, I decided to design a program plan that stayed below 40,000 €, but still offered plenty of data for the public in the end. The largest item in such a plan would then have to be personnel, and not tools. A nice hand-held laser scanner easily costs over 10,000 €, and squandering more than 25% of my total budget on one just wasn’t on. As usually the case, I therefore had to plan the digitizing via photogrammetry. Given the confined space available in the Bone Cellar, photogrammetry also seemed a good idea. After all, I didn’t want to have to carry the bones elsewhere, especially as there currently is no lift due to construction work at the museum. 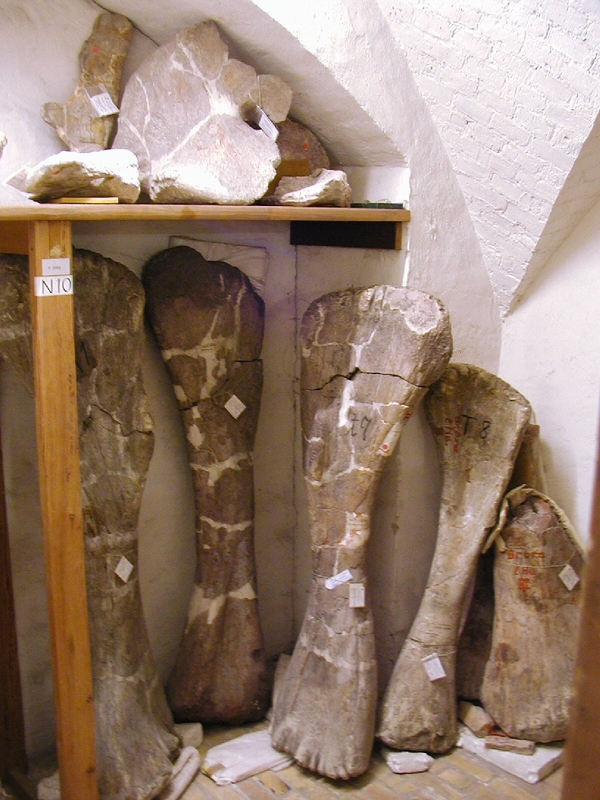 In the end, I sent in a proposal that promised to digitize 360 long bones and girdle elements of the Tendaguru sauropods and Kentrosaurus, bones that are difficult to handle and should see more study than they do. Additionally, I will also clean up scans of the old dig diaries’ excavation sketches in which these bones are mentioned. All the data goes online via a special web interface, so that people all over the world can easily find the data, check out the 3D files, and request high-resolution versions for their research. And lo and behold! – my project was granted in full! I got a call a few days in advance of the official decision, and was told that it was the first 3D digitizing project digiS would fund, because for the first time they saw a real use for the 3D files, and that although the project was very ambitious, the digiS team felt that if anyone could do it, I could. They had looked at my publications and at my blog, and basically wanted to see if I was all talk or if I would do the job 🙂 Well, here goes! 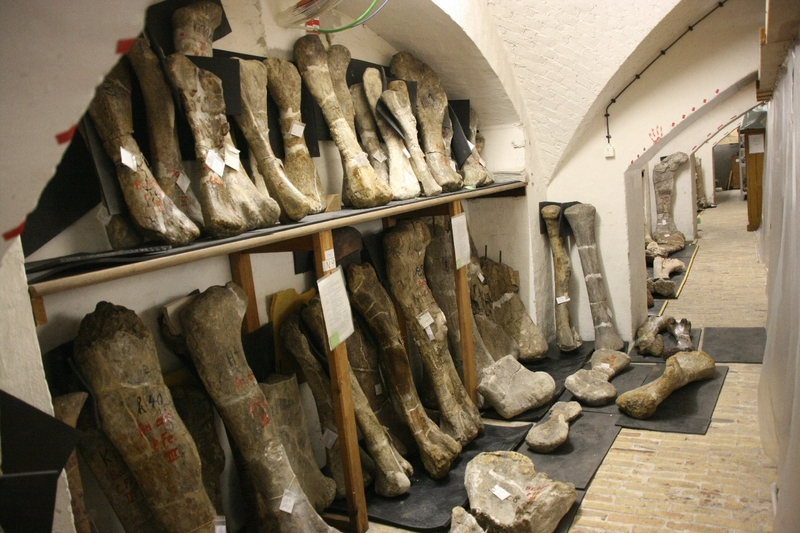 One thing I really needed to find was a very quick method to digitize all the bone in the confines of the Bone Cellar. And by now I have perfected my first rough idea, by trial and error, into something that works quite smoothly! I’ve already posted about the photography method, including a video, in the last post. Here, let me quickly explain how I create my models from the photos. I put a styrofoam support under the bone for both sets. Obviously, that’s visible in the sparse point cloud as well. However, it is important to do this, as you will see in a second. Well, that’s quite a bunch of floating nonsense data there, but as you can (I hope) see in this screenshot, the floating stuff does not touch the bone! 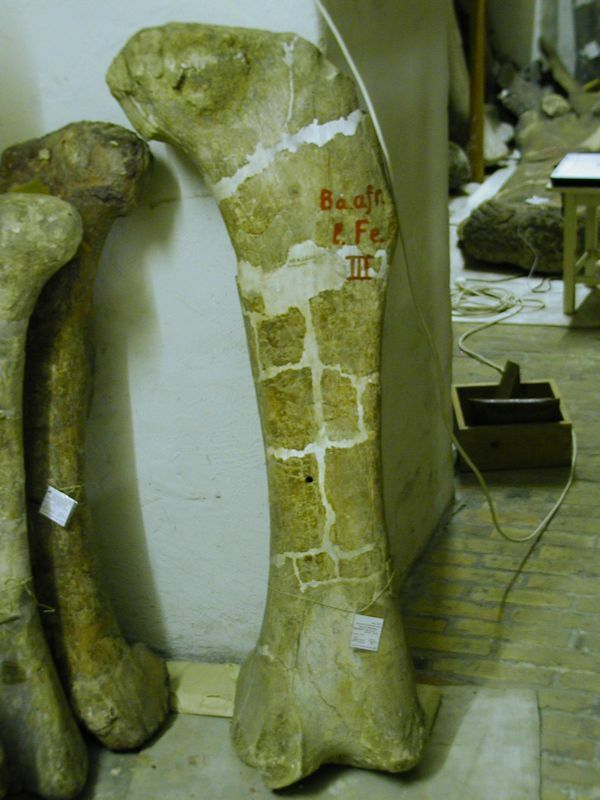 That’s because the bone projects beyond its support all around, instead of lying flat on the ground. And it means that cutting away the excess points is quick and easy. This entry was posted in Berlin, Dicraeosaurus, digiS, Digitizing, Dinosauria, Giraffatitan, Kentrosaurus, Ornithischa, photogrammetry, Sauropoda, Sauropodomorpha, Stegosauria. Bookmark the permalink. Congratulations on your project being granted! Congratulations Heinrich, that looks like a fantastic project. Making all that data freely available on the web will be just awesome. Even tho’ you’re only going to be digitising the bits that attach to the vertebral column, I’m sure that the SV-POW guys will be rapt! (Well, except for Kentrosaurus 😉 ). Congrats and this look amazing! Let me ask you a question! I have been trying to do something similar with Agisoft Photoscan (Std). Unfortunately the standard version does not have the alignment tool that you use to combine the photograph sets. Do you know or can suggest any low budget alternative to do this? I somehow missed this when you posted it. What absolutely awesome news! Hopefully if it goes as well as seems likely, you can get followup funds to do the (much more interesting) vertebrae, too? I don’t think so, rinse&repeat would be too little. But let me put it this way: there will be 3D models of the verts, even if not on digiS money.